Part A2: "Tools of the Trade: Designer's Tools"
They say a bad workman always blames his tools: No excuses, then, in Formula 1 - the designers have access to the latest and best equipment available. With many teams having sponsorship or supply link-ups with computer companies, they can both work for each other. The computer company will provide machines, the latest software, and back-up support in case of any problems. In return for these benefits, the computer firm is officially linked with the team for advertising purposes, but more importantly, the team provides a test bed for software and machines. Yes, long gone are the drawing board filled design offices - although some designers (most notably Adrian Newey) have a few lying about for nostalgia's sake! All design is now done on computers - in fact, even 2D is now almost long gone. Designs penned on drawing boards were always done as two dimensional drawings, showing views of the top, side, and bottom of the part, along with dimensions which could then be pieced together in the manufacturer's mind to create the three dimensional part. 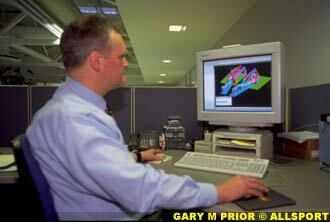 With the advancement in computing technology, however, the power is now available to design in three dimensions. The industry standard 3D package is CATIA, but as mentioned before, different teams link up with different software companies, and use different design packages. They are all similar, however, so switching teams - which is an oft occurrence with design office personnel - doesn't necessarily mean a whole new learning process. The advantages of a 3D design package are clear. 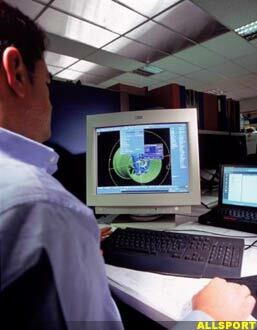 The car, or part the designer is creating, appears on the computer screen as if it were real, and the package allows the user to zoom in and out, and spin the model in all directions, as if he were rotating a solid model in his hand. This makes it much easier to visualise the part the designer is creating, and allows him to make sure it fits in the correct position on the car without fouling any other objects. Drawing is done by creating solid blocks on the screen, then asking the computer to carve and drill them using different techniques, to produce the shape the designer wants. Parts are designed individually - for instance, the front wing mainplane, flap, and endplate are all separate drawings. However, they can easily be combined on the screen so the designer can see the entire picture. Large assemblies take up lots of computer memory, however, and make even these powerful computers struggle to perform, but the uses are endless, and teams even make computer set-ups of rule boxes to ensure any modifications remain legal. Also, unlike a drawing board, modification of the part is easy, and an impressive and important part of the system is its ability to backtrack. By producing a neat, traceable, and easy to move around history, the designer can alter dimensions on the part or even change its shape. Now a computer drawing can be made in 3D, parts can be made without even seeing another person. Some manufacturing machines can take a computer file from the designer, and use the information in that to cut or form the part required. The most modern automatic manufacturing technique is Stereo Lithography, which is mainly used for wind tunnel model manufacturing - as the parts it creates are not generally strong enough for full-size use. The process uses lasers to construct a solid part out of resin using the designer's computer file, and it can create astoundingly complex parts. The lasers skim over the surface of resin in the machine, and set the areas where the computer says the part exists. This is done for the layer above, and the one above that, until the part is complete and although it takes quite some time, the machine (unlike a person) doesn't need to sleep, eat, or relax! It can be set with a job and can make quite a few parts overnight - and the complexity of parts it can manufacture is limited only to very small dimensions. A machine such as this is a massive time saver. For example, to manufacture an engine cover using traditional methods, a wooden pattern had to be created to the outer dimensions of the part. Next, once this was smoothly finished, a mould of this had to be taken. After this, the mould could be used to lay up an engine cover, which would then have to be cured, broken out, and sanded to a smooth finish. This process took days to complete, yet with the Stereo Lithography machine, once a 3D computer file has been sent it will take less than 24 hours to produce the part - and near zero man hours. So is this the end for model makers and machinists? Well, not quite, there are still plenty of simple jobs which are actually quicker for a skilled machinist to manufacture. The advent of the 3D computer package also began the development of Computational Fluid Dynamics (CFD) - a fairly new technique in aerodynamic testing where a computer model of the car can be effectively run in a computer wind tunnel. The CFD consists of an extremely complicated mathematical programme which allows the computer to blow simulated air through the simulated wind tunnel and over the simulated car to simulate downforce and drag! The computer model created by the designers is modified by the CFD operator, who basically covers its surface in hundreds of tiny triangles. Each of these triangles has a number of extremely complicated sums involved with it, and the more triangles, the more accurate the results become. It would take a mathematician days to evaluate just one answer to one triangle, so it is not surprising that the process can take days to complete on a full model of the car, but its advantage is that you don�t even have to build the part you are testing. More usually, CFD is used on just a wing assembly not attached to the car. This is much quicker (it sometimes takes only an hour), and gives the designers a clue as to whether to go ahead and build a model of it to test in the wind tunnel. The CFD results come in the same form as those from a wind tunnel (downforce, drag, and centre of pressure), but that is where the similarity ends - the information available from CFD is huge. The model of the car can be viewed as it can in the design stage (rotateable and zoomable), and the computer can pictorially show the flow around the car. Using colours for scaling to show the different values, the streamlines can be shown, to demonstrate the exact path the mathematics decided the air takes. This flow visualisation is an extremely important part of the CFD process, as it is something that is difficult to obtain in the wind tunnel, where the equivalent is a single piece of wool blowing in the air! As well as streamlines, you can visualise surface pressures (done in the wind tunnel with pressure tappings, which cannot provide the definition of coverage seen here), velocity vectors (the direction and speed of the air) at any point on the car, and even pressure distributions in the wake, which is virtually impossible and extremely time consuming to obtain accurately in a wind tunnel. So are the ever increasing and improving tools of the trade making a designer's job easier? Well in a way, yes, but they are also making the parts the designer can create much more complicated and more advanced. What is true, however, is that having the best tools can certainly give designers the edge. Next Week: "Car Creators: On the shop floor"